in garter st on larger needles; 6-st cable = 1¼ wide on larger needles. 34¾ (38½, 43, 47, 50¾, 54½)" circumference at underarm. Sweater shown measures 38½ "; modeled with 6½" of positive ease. 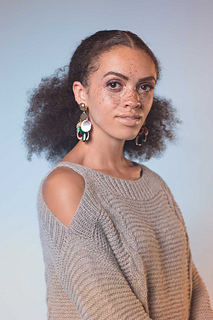 The Shimla Sweater has a classic drop-shoulder silhouette with several modernizing design elements, including a unique cold shoulder, short side-hem slits, and thoughtfully placed cables on the front and back. 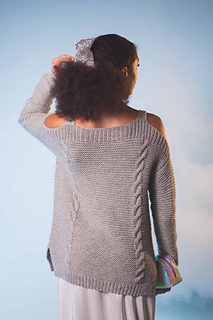 The cozy pullover is worked bottom up, and the sleeves are worked top down. Finished Size 34¾ (38½, 43, 47, 50¾, 54½)“ circumference at underarm. Sweater shown measures 38½ “; modeled with 6½” of positive ease. Yarn Sugar Bush Yarns Rapture (50% LlamaSoft, 50% superfine Merino wool; 211 yd/3½ oz): #1004 silver splendour, 5 (5, 6, 7, 7, 8) skeins. Needles Size 6 (4 mm): straight and set of double-pointed. Size 7 (4.5 mm): 24” circular and set of double-pointed. Adjust needle size if necessary to obtain the correct gauge. Gauge 17 sts and 30 rnds = 4” in garter st on larger needles; 6-st cable = 1¼ wide on larger needles. 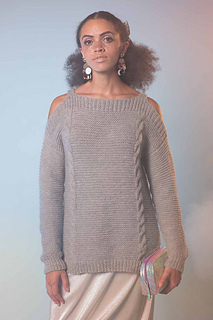 Notes The body of this sweater is worked in the round from the lower edge to the underarm, then the upper front and back are worked separately back and forth. Sleeve stitches are picked up along both the front and back armhole, and the sleeve is worked in the round from the top down.